Technical accuracy and attention to detail are the strongest characteristics of Scotty's style. The sharp contrasts and delicate shading create in the viewer the same excitement that Scotty feels for his trains. Scotty's works have been avidly collected ever since the release of his first of the Southern Pacific caboose #1212 in 1987. 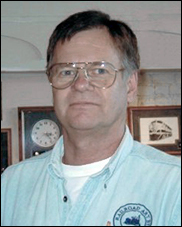 His works, including historic American railroads, short lines, narrow gauge and modern diesel equipment, are available through The Train Store. Each original piece of artwork is painstakingly created using pen and ink. Working under a magnifying glass, Scotty uses a very fine pointed technical drawing pen and a process called pointillism. This involves many thousands of dots of ink and no lines to complete a drawing. Each drawing is carefully reproduced on high quality, acid neutral paper by lithographic printing process, then embossed with Scotty's signature. The Cumbres and Toltec Scenic Railroad #488 and another KSC Locomotive are now available.